If there is one thing for sure in college basketball, the weather is never an issue. 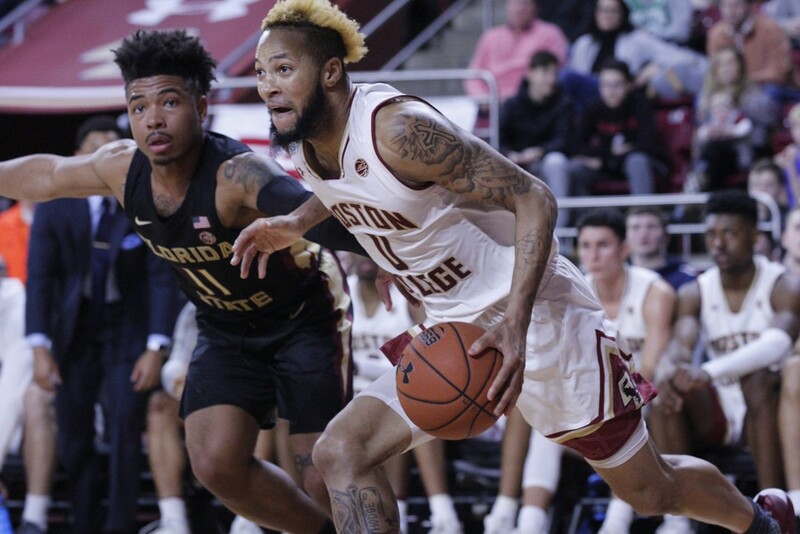 Despite an overnight snowstorm and difficult travel, the #11 Florida State Seminoles and the Boston College Eagles played hoops on Sunday afternoon. Both teams were looking to snap losing streaks. For the Seminoles, they were trying to stop a two-game skid. While the Eagles were trying to halt a five-game slide that began back on New Year Eve vs Hartford. The Eagles losing woes have put them in a bad position in the ACC as they began play on Sunday in last place in the conference standings. For the Seminoles, after a solid non-conference slate, their slow start in league play has them toward the bottom of the league standings. At this point of the season the game meant more to the Eagles than Seminoles. However, both teams were looking to right their ships. Guard play would be the theme of the day for the Eagles as the trio of Ky Bowman, 37 points, playing his fifth game in a row of 40 minutes, Winston Tabbs with 12, and Jordan Chatman with 17 led the way. Their ability to knock down shots, especially in the second half, was huge for the home team. Boston College shot 49% from the field for the game and 51% in the second half. The Eagles were on target from behind the arc in the second twenty minutes hitting eight of the ten shots they took from deep. On the defensive end, the Eagles took it up a level limiting the Seminoles to only 21% from three-point land (3-14) and 36% percent from the field (12-33) in the second half. Before all of that took place, Boston College had to go through another rough stretch of basketball. A 19-3 Florida State run put the Eagles in a bit of a hole. Senior guard Terrence Mann (14 points) had seven during that run. Trent Forest matched that output with seven of his own. It was starting to look like another long afternoon for the Eagles. All of that changed in the second half. Boston College began the second twenty minutes on a 13-2 run that would tie the game at 48-all. Back-to-back three-point baskets from Chatman would give the Eagles the lead at 54-50 with 14:32 left. Chatman was feeling it as he made it three in a row from long distance to give BC a seven point advantage at 57-50 with 13:31 to play. In all, Chatman would hit five from long distance to give the Eagles an eight point lead at 66-58 with 8:17 to play. Bowman got into the act with a bucket and one that handed the Eagles their first double-digit lead at 71-60 with 6:55 left in the game. As Seminoles head coach Leonard Hamilton said afterwards “BC did a good job of getting the ball to their shooters” on Chatmam, the coach said “he allowed the game to come to him in the second half. Florida State managed to get to within four at 86-82 late in the game. Boston College hit their foul shots at the end to seal the win. An unsung stat of this game may be the Eagles at the foul line. For the game, they were 71% at 20-25. In the second half alone they hit a blistering 13-of-16, 81%. BC head man Jim Christian thought everyone “played well”. Boston College has been through a rough portion of their schedule having played three of their first four on the road. The coach believes his team has weathered the storm. Now, if he can keep this team healthy, Boston College may yet still be a factor in this league. For Florida State, Mfiondu Kabengele led the team with 26 points and nine rebounds. M.J. Walker finished with 12. The Eagles are off until next Saturday when they head back out on the road to Wake Forest.